^Ron Schuster, accepting the Freeman Lacy Lifetime Achievement Award during the 2012 Magic City Music Awards. Ron Schuster could tell a thousand stories through vinyl. At one time he owned more than 5,000 records but has since paired his collection down to an essential 2,500 albums. Armloads at a time, Ron’s records overtook the house and slowly migrated to the garage. During a garage sale someone offered Ron $500 for the collection, lined alphabetically on handmade shelves. “That’s not even a $1 per record!” Ron exclaimed. “Add another zero to that and maybe I’ll consider it.” The buyer left empty-handed. Ron’s records may have been quarantined to the garage, but as I run my finger along the clear plastic sleeves, feeling the spines of the records, it’s obvious that this man’s record collection is invaluable. Ron has invited me to his home, nestled against Billings’ northern rimrocks, to eyeball his music collection, which includes thousands of CDs and bunches of cassettes recorded in the 70s and 80s. Ron’s music collection continues in a den-like area where he’s got two walls of CDs flanking a TV playing a live stream from a European music festival. Winn Butler of the Arcade Fire swings his head, throwing a sweaty Mohawk out of his face. I’m impressed—Ron knows the band, even has a favorite song: “Leave the Car Running.” These Canadian indie rockers aren‘t unknown, but they aren’t well known, either, especially to the baby boom generation. I suppose I imagined Ron in his man-den spinning hit records from the 60s and 70s, not flipping music channels between Fatboy Slim and Arcade Fire. Ron was one of the first on-air programmers in the early 1970s at the fledgling Billings public radio station, KEMC, and he maintained a program on public radio for 30 years, which he recorded from his home. In the corner of Ron’s den, he still has an area set up for recording radio shows, though he’s been off the air for more than a year now. Hosting the program forced Ron to seek out new music on a weekly basis, from roots to rock to reggae music. In the heyday of radio, Ron received boxes of new music in the mail to sort through. He’d pick out the oddball artists that never made it big and give them some airtime. I’ve always been drawn to Ron. He’s an amenable guy, kindhearted and always in good sprits. He’s a man of quiet softness with peppered hair and warm eyes who married his high school sweetheart. He’s the kind of guy who lights up a room with a smile so genuine that you can’t help but smile back. Ron’s charisma is natural and his charms can sway a room, especially when he’s got a guitar in hand. Yet Ron’s hands haven’t held a guitar in months. I first noticed Ron’s failing health during a “rent” party at Allied Music Studios—a monthly gathering in which attendees drop cash into an upside-down Djembe, get a dose of live music, and help sustain the studio where local musicians record and teach. Ron was wearing a colorful crochet beanie and a gigantic smile, even though he was struggling with losing clumps of his hair from chemotherapy. In the corner of the room Ron sat on a piano bench watching Dan Page—a Billings singer/songwriter Ron helped mentor along the way—strum original tunes on his guitar. In Ron’s face, thinned by the cancer drugs, there wasn’t a signal that cancer ravished his sprit, but rather that his cup was filled with the most exceptional memories, one he would continue adding to as long as he could. Six months later I find myself surrounded by Ron’s musical collection having a glass of red wine and asking him about his musical past. His failing health lingers in the back of my mind, especially as he finds himself trying yet another chemotherapy to keep the cancer at bay. These pills, he tells me, come with a warning that women shouldn’t touch them. “And I’m putting that in my body. Makes you wonder,” he says. Yet through his stories, Ron comes alive. Ron’s collection of music represents a lifetime of musical consumption. Ron cultivated his love of music in a record shop located in the old Hart-Albin Building. Spanning the corner of Broadway and Second Avenue North, the building was home to a sprawling four-story department store—the heart of retail in Billings from the early 1900s until its closure in the 1980s. In the basement, where hard goods and appliances were sold, was a section reserved for music. “This area was just something they had because they sold record players,” Ron recalls, describing the space as a tiny square in a corner of the basement. In the 60s, Ron and his high school friends would paw through audio logs, ordering oddball music they read about in Rolling Stone or heard on the radio. At the time, these gigantic record catalogues were the only way for consumers and shops to track bands and their releases. Each month pages would arrive to add to the logs, chronicling the latest musical releases and billboard charts. Ron would later open his own record shop, employing some of his buddies. They’d sling records all day and jam music at night. So began a life’s work. Ron cut his teeth on folk music, developing a love for the marriage of word and song at an early age. In his youth, Ron would listen to his father strum cowboy country songs on an acoustic guitar, which tweaked his interest in playing music. Ron was ten years old in 1959 when his parents divorced, and his father left the guitar behind. Ron would sit and play single string songs such as the theme to the Twilight Zone or the early 60s surf-rock song “Pipeline.” As he got older, he’d pluck at the guitar during parties, and he found the attention people paid to him alluring. Ron started his first band, Poison Ivy, in high school. The group gigged at school and several teen clubs around town. This was the mid-60s, and rock and roll trends were moving to a more eclectic and electric form of rock. Eight-tracks were the latest thing, allowing music listeners to pick the music that they played, instead of hearing it on the radio. Ron recalls the shift: “You’d hear bands like Buffalo Springfield and the Moody Blues on the radio, but only one song. We’d go buy their album and drive around in a trance.” Music seemed to be what linked everyone together, and in Billings on the weekends Ron and his friends would listen to music in their cars and congregate at the clubs. The summer of his junior year in high school, Ron dove into the hippie subculture after spending time with some progressive thinkers he met from Colorado, including the charismatic Mac King. After graduating high school in 1967, Ron traveled. He bummed around Europe, lived in England for a few months, and even took a Volkswagen with stick-on flowers on its sides to Mexico, where he and his comrades planned to bring back loads of marijuana to the states. They got sick on the food and decided Mexico was not the place for them, and they turned around. When Ron returned to Billings, he found that many of his graduating classmates had moved northwest to Seattle or into Colorado. Ron headed to Denver where he worked construction and bought a Martin guitar. The guitar sat untouched for more than a year, however, as Ron’s dry hands were constantly covered in open sores from working with concrete. Ron returned to Billings in the late 60s, lonely, homesick and broke. Many of his graduating class who made the mass exodus had also returned—the familiarity of Billings pulling them home. Ron found himself back in Billings in the middle of the hippie movement and afraid to be drafted into the Vietnam War. His brother was a marine and had served in Vietnam, and Ron was drafted after returning to Billings. “I declared myself a conscientious objector, which at the time, if you could prove it, meant you would be exempt from the draft. I took a battery of tests to prove I was against killing people, and I got a one-year psychological reprieve.” Ron headed back abroad to Europe shortly after, were he would receive no further draft calls. Yet Billings continued to call Ron home, and he returned again, this time rekindling with two musical friends from high school—both named Bob Brown. Nicknamed “Carb,” one Bob currently resides in Billings, and the other Bob lives in Coeur D’Alene. These two men were instrumental in getting Ron back into playing guitar. In the 70s Ron opened a Budget Tapes and Records, part of a chain of record stores based in Colorado. The store had couches for lounging and music mags for reading, incense was always burning and cool music was always playing. Here you could snag a t-shirt, drug supplies, and of course, records and tapes. Ron and both Bobs manned the record store. The Bobs lived together in an apartment behind the record store, and Ron was living on his own in a two-room house. They would come together in the evenings and jam. From this basement thrashing, bands started to form. The musical melding of Ron and both Bobs became D’ Club La Peach, a name inspired by the Allman Brothers album, Eat a Peach. The group also included Joe Sullivan, Tom Brown, who was Carb’s brother from Casper, and Pat Rogers. D’ Club La Peach evolved across the years to many different bands, which would break up and form into another band. Ron joined the Neo Trio, started by Bob Brown with Tom Cockral (on keyboard) and Pat Rogers. 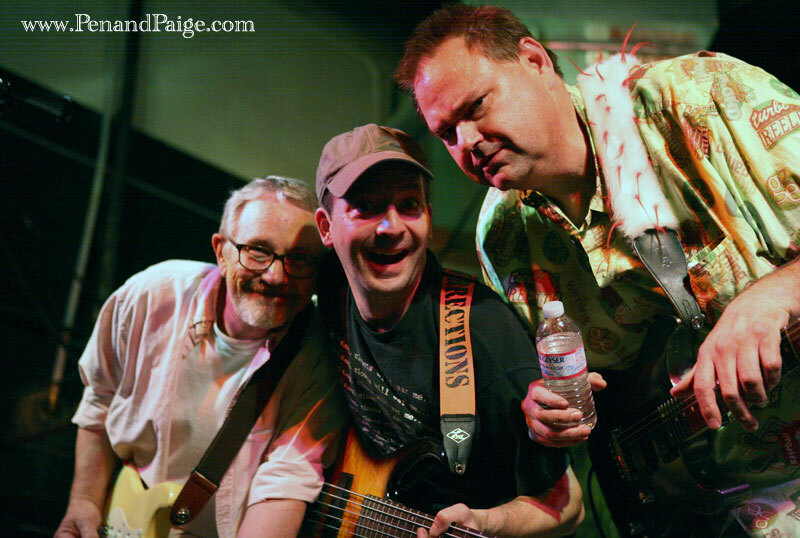 With the addition of bass player Bruce Gagne, the group became a five-piece trio, which would eventually evolve into Dr. Pluto, remains of Neo Trio and the Southside Swing Band. Ron sold the record store in the mid-80s to pursue music full-time, and he hit the road with Dr. Pluto. “We played a week at a time—that’s what the tours were then: Tuesday through Saturday,” Ron explains. The group played across Montana and into Idaho, and attracted the attention of a Minneapolis-based booking agency called Good Music Productions. “Just about that time, two of the guys decided they wanted to quit because they had gotten married, had house payments, and didn’t want to travel anymore. So that band blew up and died.” Naturally, Ron was disappointed. He had quit a good paying job and gave up interest in a record shop to pursue music full-time, and he had to start over. Ron went on to play with Soul Brat in the mid 90s, a group whose music can best be described as party fuel. With bass smacking, conga thumping, reggae grooving, New Orleans-inspired funk, the music of Soul Brat always brought a good time. It was during this time with Soul Brat that Ron was diagnosed with cancer. “I was out of commission for three months, and missed one gig for which they found a replacement guitarist. Soul Brat went on without me.” The group didn’t last long, however, as members scattered. 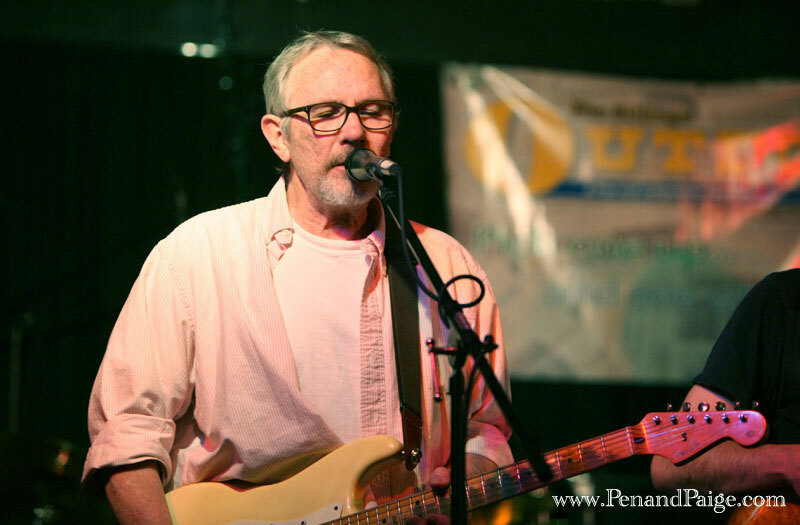 Bob Brown moved to Coeur d’Alene, the charismatic lead singer and bassist Todd Eagle moved to Vermont for a short time, and the group struggled to stay together. Soul Brat in their performance at the 2010 Billings Outpost Tuney Awards. 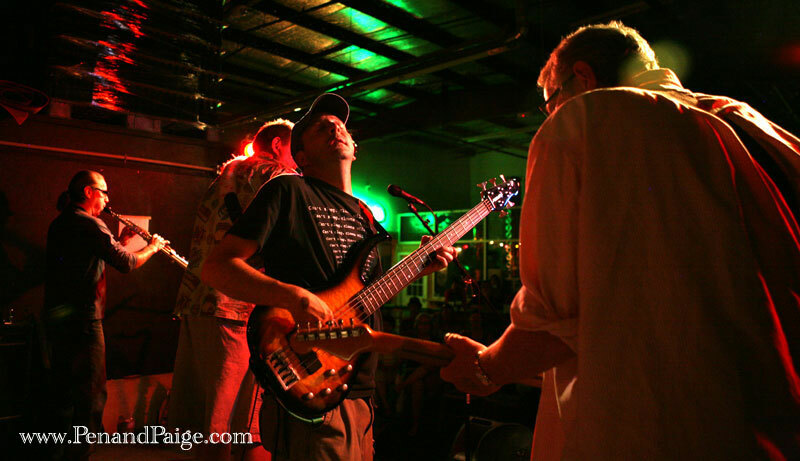 Ron, at right, performs with Soul Brat. Bassist Todd Eagle is seen at left, with Ernan Cortez on sax in the background. Soul Brat rekindled in 2010, coming together to perform at the Billings Outpost Tuney Awards, an annual musical gathering that honors local music and musicians from the past year. Seeing the group come together after so many years was like being privy to one big, inside joke—one that you actually got. At 63, Ron has carried cancer in his body for more than 13 years. Doctors say his cancer is not a curable disease, but it’s a manageable one. Ron coughs occasionally as we talk, and I’m not sure if the cancer is causing the rasp in his voice or if it’s his natural tone. He’s been through hell with these treatments, the latest being three rounds of experimental Leukapheresis procedures across a two-month period in early 2012. Hundreds of thousands of dollars later, Ron’s hair has returned and the gaunt and ghostly image he carried due to the cancer drugs is gone. The price tag is steep, but like Ron’s record collection, it’s impossible to put a price on a man’s life. Since this piece was written, Ron has returned to his guitar playing under the moniker Schuster, and was honored at the 2012 Magic City Music Awards for his lifetime achievements in music and his endearing presence in the Billings music scene.